Niels and I were talking the other day about how your perception of a house can vary. 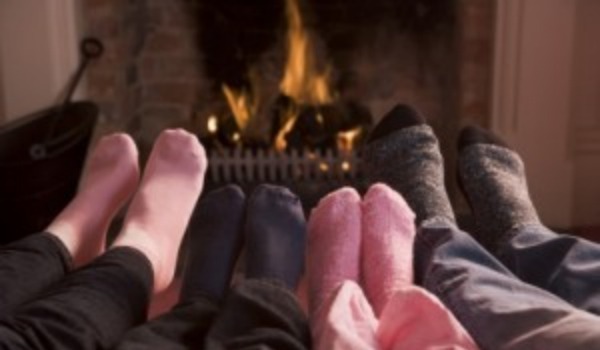 For most people, most of the time, when you walk into someone's house, you think about how cozy it feels, or as the Dutch say, gezellig, which, by the way, is a fabulous word that can't really be translated. It infers a sense of not just coziness, but warmth, hospitality and a sense of contentment with one's company. It's a home that is lived in and loved in. That feeling has nothing to do with with fixtures and finishes, and has everything to do with how at home you feel when you're in it. Think of a time when you were enjoying a meal or conversation with a loved one and thought you wished that you could live in that moment forever. That's gezellig. Now, when you are in the midst of building, or thinking about building, or selling, or thinking about selling, homes become houses and you mentally break them down as you focus on different aspects. There are several homes that Niels and I have been multiple times and come away with different thoughts each time. For the first couple years of our marriage, we looked at layouts: how many bedrooms, how the rooms flowed together, the overall size and feel, the function of the kitchen, colors and fixtures that caught our eyes, etc. We wrote all these things down in a wishlist and handed it over one day to our builder and designer. Our builder laughed at us, but happily, our designer was able to come up with a plan that gave us everything we needed and most everything we wanted. After that, how we saw other houses depended on where we were at in our own building process, and we saw through the lens our next set of selections. When we were breaking ground, we were thinking about full ICF walls and looking forward to quiet walls and low utility bills. When the framing went in, we were thinking about where light switches would go and what kind and color we would use (white rockers) and how high they should be and how many we should have. Same with outlets. And TV outputs. And ethernet connections. All along the process we went, for the most part, til recently, all our decisions were the structurally, behind-the-scene things that no one other than our family and friends (maybe) and other potential home builders (possibly) find interesting. Until now. We're coming up to the last few weeks and finally, all the polite folks who have been following along (18,000+ views!--who are you people!?) Now our house is turning into a home. First with our cabinets, and now, PAINT! I can't tell you how excited I am. To me, paint means we can see the finish line. Paint means home stretch. Paint means our dreams of a gezellig home are coming true. So after that long-winded introduction, the painters have descended upon our new house! The crew got started on Monday, taking down all the doors and carefully numbering each one, along with its corresponding frame. Yesterday, they spend the day caulking all the baseboards and door frames. I was a little surprised that the trim work went on first because it seems like it would be easier to paint the walls first. They explained to me that the trim that is put on is primed, but not finished, so they'll actually paint them when they do the walls. This crew painted our old house when we were staging it for sale, so we'll trust them. They do a great job so clearly they know what they are doing! Today, there were three guys hard at work. One guy was busy staining all the trim pieces that will match the espresso cabinets: hand rail for the stairs, stair cap, tub surround, mud room lockers and foyer niche bench. They were planning to match the dark espresso of our cabinets, which is a tad darker that we thought it would be. The inside of the cabinet doors are a bit lighter, and show the grain better. So that's the hue they'll match. I love how the hand rails look. A second guy was finishing up the caulking. The last bit to do was around our finally finished trim piece above the fireplace. Seeing that ladder reminds me why we better love the color in the great room. There's no way I'm repainting that! The third guy was upstairs using the sprayer to start painting the trim white. I didn't want to get too close, but I did snap a few pictures from the stairs. You can see that they took great care in covering and sealing all the cabinetry and fixtures and securing them with painter's tape. There's the view down the hall to D's bathroom. Here you can see that the door frames and baseboards in the hallway are done. It'll take the crew about two weeks to finish painting. As I was talking to one of the guys, I mentioned how, before I got sick this fall, we had hoped to be in by this weekend (my 40th birthday). Then we had to revise our hopes to maybe have a floor to sit on and a counter to set a cake on. Then I laughed and said, "Maybe you could put a dot of actual color on the kitchen wall for my birthday gift." He said, "We'll try to do a little better than that." If all goes as planned, the walls will start getting their final paint color on Friday. Our flooring has been delivered to our supplier, and after all the priming is done, the floor crew will get started. The two crews have a schedule set up to work around each other and our house should start looking very gezellig very soon.